Readers of this blog will know that I have a particular interest in John Owen’s covenant theology. His commentary on Hebrews 8:6-13 was a breath of fresh air when I first read it several years ago, and I have done what I can share Owen’s view with others. Part of that process has involved challenging misrepresentations of Owen’s view such as Iron Can’t Sharpen Iron Without Honesty and McMahon’s Misrepresentation of John Owen. Amidst discussion of “republication” I have been disappointed by the neglect of Owen’s view as part of that discussion. Although his view of the Mosaic Covenant fits very closely with Kline’s and with “republication”, he doesn’t fit the modern paradigm because he recognized this meant he departed from the WCF. Modern proponents are very eager to retain their allegiance to WCF, so they say as little as possible about Owen. This may be a good example of the problem bad rhetoric creates in this discussion. Is John Owen to be considered one of these various views? If so, then Dr. Clark’s statement is false and he is guilty of over-stating his case. To be sure, others before Kline, such as Bolton and John Owen (1616-1683) were compelled to dislocate the Mosaic Covenant from the Covenant of Grace, perhaps because they did not ascribe as much significance to the typological function of the Jewish covenant. …Later on Jeon says, “Owen admits that in a sense the Sinaitic Covenant was ‘a distinct’ covenant, and not a mere administration of the covenant of grace….” But for Owen, the covenant made at Sinai was distinct in every sense. …Owen’s arrangement consists of the Covenant of Redemption made between the Father and Son in eternity, the Covenant of Works made with Adam before the fall, the Covenant of Grace made with believers, and a “particular, temporary covenant” made with Israel. …Owen separates himself from the classic-administrative view, adopting the subservient view. Why not subsume the discussion about Owen under the Subservient Covenant where it belongs? …The first view that overly limits the Mosaic Covenant is that the covenant was only a carnal, temporal covenant. His concern is to protect the soteric nature of the Mosaic Covenant. About leading proponents of this view, he writes, “Papists have led the way, and Socinians and Anabaptists follow.”103 We might also add Reformed leaders like Owen. This is what Bolton calls the Subservient Covenant view. …Owen’s view of the carnal, Mosaic Covenant is apparently no respecter of theological systems. …Owen’s approach highlights the organic question, contrasting his subservient position with the common administrative view. Again, with Owen we see points of contact between his view and Socinians, Roman Catholics, and Lutherans on the organic question. So it seems Dr. Clark is correct to say there were a variety of views, but incorrect to say that “in no way did any of those views imply that the Mosaic Covenant was not also an administration of the covenant of grace”. Furthermore, in Ferry’s response to Ramsey, he admits that the subservient view was contrary to the WCF (but argues Kline’s view isn’t subservient). 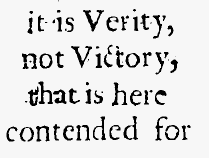 Thus Dr. Clark is wrong to suggest that all the various views were equally confessionally acceptable. Having very clearly demonstrated from quoting Owen and quoting the thesis paper Dr. Clark recommends to everyone that Dr. Clark’s statement was false, what was the response? Brandon, you’ve been shown before that your reading of Owen is inadequate. In other words, I’m not allowed to discuss this issue any more on the Puritanboard. Someone prominent on the board disagreed with me, so obviously I’m wrong (please do read the link the moderator refers to, it’s laughable). Apparently it doesn’t matter that both sides of the republication debate have published papers supporting my statements about Owen (in addition to Ferry, see the Kerux review). So, when the issue of what it means to be Reformed gets discussed, we ask not to be lauded and applauded, so much as simply, accurately and fairly recognised as existing. It may be that you just did not realise that we exist. It may be that the kind of Baptist convictions – about soteriology, ecclesiology, pneumatology, doxology and a whole bunch of other ologies – to which you have been exposed have left you with some serious and significant questions, and you have given up looking for the answers among Baptists. It may be that you have met some who take the name of Reformed Baptists who, through pride or ignorance, have left you with a sour taste in your mouth, for which I am sorry. It may be – and I say this in a spirit of straightforward inquiry and not backhanded accusation – that you would rather not acknowledge this part of the spectrum because it does not fit into your historical narrative, and rather upsets your carefully piled apple-cart. But please do not repeat the old saw about Anabaptism; if I might be so bold, it will not wash. Neither dismiss us with the vague assertion that there are some Baptists out there who are both Calvinistic in their soteriology and traditional or conservative in our doxology. That is not what we really are, certainly not all we are. An honest historiography surely requires that – if nothing else – those original Particular Baptists (discounting, of course, the apostles and the early church!) are at least considered on their own terms, and taken for what they believed themselves to be, even if you might disagree with them. I’ve been using a new app on my computer called BreakTime. I really like it. It’s well designed and works well. 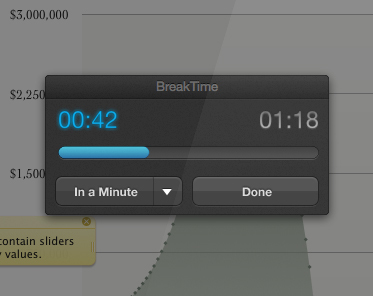 BreakTime is a simple utility that’s designed to help you remember to take breaks away from your computer. It never forgets a break, running in your dock and / or menu bar (or even in the background). I’d love to work with someone to develop a similar app that focuses on presenting Bible verses at intervals. With BreakTime, at the set interval (30 minutes), the app appears over all your other apps so you can’t use them until the 2 minute break is up. Instead of forcing a break, this app would present a verse for you to read. It could the lock you out for 2 minutes in the same way as BreakTime, or it could require you to type the verse 5 times before going back to work. If you, or anyone you know, is a developer let me know. MPI is a great organization funding pro-liberty film projects. They’ve helped fund several great documentaries. (See films Halvorssen has been involved in) Take a look at their recent news update (make sure to watch the video after reading). What a sick joke. MPI’s newest documentary,U.N. Me, reveals how the U.N has abandoned its responsibilities to foster peace and freedom, instead allowing dictators to tie its hands and dominate its agenda. On June 28, MPI founder andHuman Rights Foundation(HRF) president Thor Halvorssen witnessed this firsthand. Thor was scheduled to testify at the U.N. for the campaign to stop Hugo Chavez’s bid to elect Venezuela to a seat on the Human Rights Council. Right out of the gate, Thor began cataloguing the Venezuelan government’s numerous human rights violations. Allowing Venezuela onto the council, he said, would not only be a shame and embarrassment, but would also serve to validate authoritarian governments like that of Cuba. Needless to say, his speech was met with strong protest. The China, Russia, and Pakistan delegations joined in the tirade, demanding he be silenced. Thor’s speech was then immediately cut off by the Human Rights Council president. Time and time again, the U.N. allows tyrannical states a platform for their own agendas. As Thor witnessed, even the council specifically designed to protect human rights forbids the condemnation or even questioning of known human rights violators. The U.N. may still claim to uphold lofty humanitarian ideals, but Thor’s experience reveals yet again just how corrupt the organization truly is — and how vital MPI films like U.N. Me are. U.N. Me is available on iTunes and through several television Video On Demand networks, including Comcast, Time Warner Cable, and Cox Communications. Learn more about the film at UNMeMovie.com, and read more about Thor’s U.N. testimony atHuffingtonPost.com. If you had $20 to spend at Monergism Books (I do), what would you spend it on?